The technology exists. So why do so many businesses crash and burn when it comes to launching successful e-business strategies? Why do flashy web sites send customers to a 1-800 number that can be accessed only during ” normal” business hours? Why do executives who market toys and games refuse to listen to their own children? According to IBM’s Internet guru, John Patrick, it’s all about attitude. Our inability to harness the full power of the Internet has much less to do with the technology itself than with the cultural and psychological barriers that straitjacket our thinking about it. 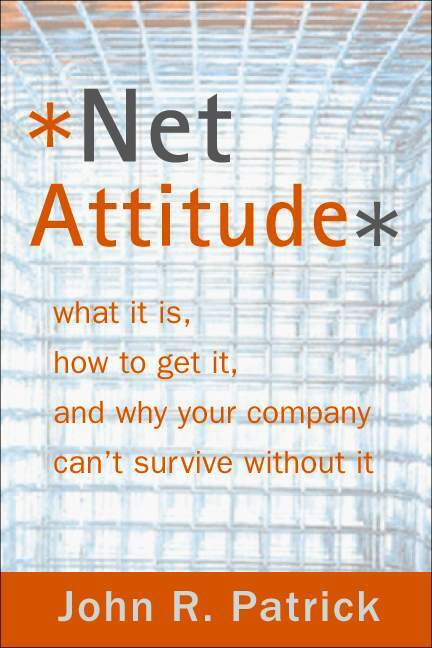 In Net Attitude he reveals the strategies, and more important, the mindset , that will allow you and your company to flourish in the age of connectivity. Drawing from a wide range of examples from the worlds of business, technology, politics, education, and popular culture, Patrick explores the profound implications of adopting an Internet attitude and how it will transform you and your business. John Patrick is President of Attitude LLC. He was formerly Vice President of Internet Technology at IBM Corporation where he worked for 35 years. In recent years he served as the company’s Chief Internet Technology Officer, a member of the company’s senior executive team, and pioneer of its Internet-based strategies and initiatives. A founding member and chairman of the Global Internet Project, a founding member of the World Wide Web Consortium at MIT, and advisor to several pioneering Internet ventures, he delivers dozens of presentations to industry and media groups around the world. He lives in Ridgefield, Connecticut. The Year 2000 was when I started “my book” and the manuscript was submitted to the publisher in early April 2001. The title is Net Attitude. The publish date was September 27, 2001. A separate site, netattitude.org, was set up that was a companion to the book — over time it became a Net Attitude community where readers were able to post their reactions, feelings, and commentary about the book. This site has since been discontinued. The links below are provided to give more information about the book.